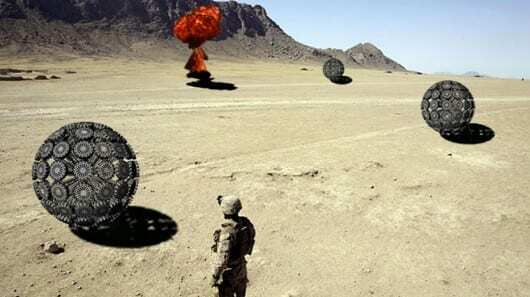 An Afghan designer has come up with a novel tumbleweed-esque device to find and detonate mines, a device that has evolved from the wind-powered toys he made as a child. Massoud Hassani’s Mine Kafon is made mainly from bamboo and biodegradable plastics, but the simple addition of a GPS chip means the wind-swept spheres can be monitored to reveal the location of mines. GPS chip aside, this is an extremely low-tech approach to mine detection. Typically the process involves the sweeping of mine fields, either manually with metal detectors, or with specialized vehicles (sometimes remotely controlled). The Mine Kafon, on the other hand, is an array of bamboo sticks with plastic disks at the end. It’s light enough to be caught and moved by the wind, but heavy enough that it should trip any mine it passes over. The Mine Kafon will probably be destroyed in the process, but better that than a human life. Clearly, the Mine Kafon will never be as efficient a means of clearing mines as an intensive sweep using specialist technology. The Mine Kafon is bound to travel the path of least resistance, and so it’s not as if you can pop one into a field and expect it to clear the area. But the ability of the Mine Kafon to report on its route, trackable on the web thanks to its GPS chip, means that perhaps, were many of these low cost devices be released at scattered locations, they might chance upon mine fields that were previously undocumented. There’s something artful about the Mine Kafon, though, that is just as valuable. Perhaps it’s the poetic symmetry of this peaceful response to the problem of land mines emerging from a nation ravaged by them. The UN puts Afghanistan’s land mine count at 10 million, though Hassani insists there are “far, far more.” Some of these are Valmara 69s, an anti-personnel mine designed to leap half a meter (or a foot and a half) into the air when tripped before scattering about 1000 steel shards over a lethal radius of 25 meters (82 ft).